When it comes to home improvement, the bathroom is one of the first places to begin. Bathrooms are used frequently, which means they need to offer functionality as well as style. When your client looks to you for a bathroom remodel, you can look to us for the products and materials you need to make their dreams a reality. At ProSource® of Collinsville, we provide top brands you trust for wholesale pricing. Backed by the ProSource Wholesale® buying power, we can provide you and your client with the products they love at prices they can afford. 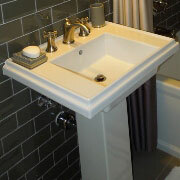 A bathroom sink should be more than just a place to wash your hands. It should provide a beautiful accent to the design of the room. 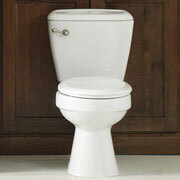 Shop large basins, small and traditional sinks, and more at ProSource of Collinsville. When you find the right sink, you need to also pair it with the perfect faucet. 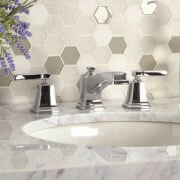 Check out our vast assortment of bathroom sink faucets when you shop our home improvement products. A place to clean off the day’s grime, a shower should be soothing, clean, and set the tone for the rest of the room’s design. When your client needs a new shower, we can help by providing the right fit for the size of the room and their unique taste. 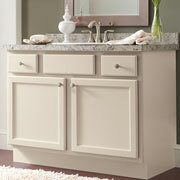 A vanity allows for comfortable grooming and extra storage. With mirrors, lights, and cabinetry, there are numerous styles to choose from to fit any budget. 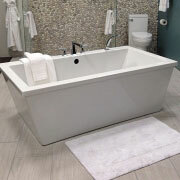 A bathroom can feature a stand-alone tub, a shower-tub combo, or even a luxury jacuzzi. Find the right choice at ProSource of Collinsville. Functionality might be the first thing that comes to mind when choosing a toilet. However, a toilet can be so much more than just functional. Browse an incredible assortment of styles, materials, and colors at our showroom.